Coming up with fun activities for Classroom Parties can be challenging. I am helping out with my daughters Valentines Day party at school this year and wanted to switch up the usual baked good offering this year. For Christmas we decorated Gingerbread cookies and the kids had a blast. I decided to come up with a creative version of BINGO. A classic game that is loved by all ages. Not wanting traditional clip art I went with a robot theme adding in sprockets, remote controls and robots in a variety of colors. 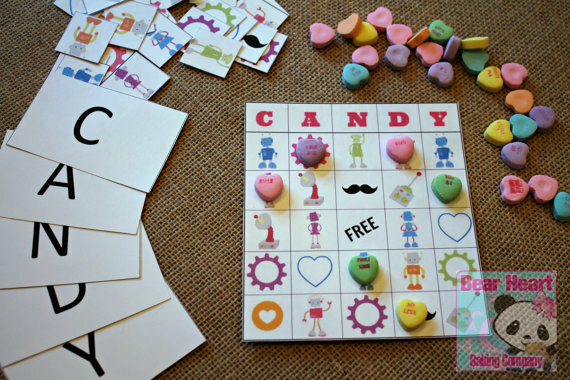 For the place markers, what else could I use to make this truly a Valentines Day game but Conversational Hearts. This is the test game that my whole family played and it was a hit. We played this multiple times before dinner. We even did Blackout and Four Corners for the winner to keep the fun going. I have this exact version in my Etsy shop available for instant download. If you procrastinate like me and need a last minute game for your childs party this is highly recommended. 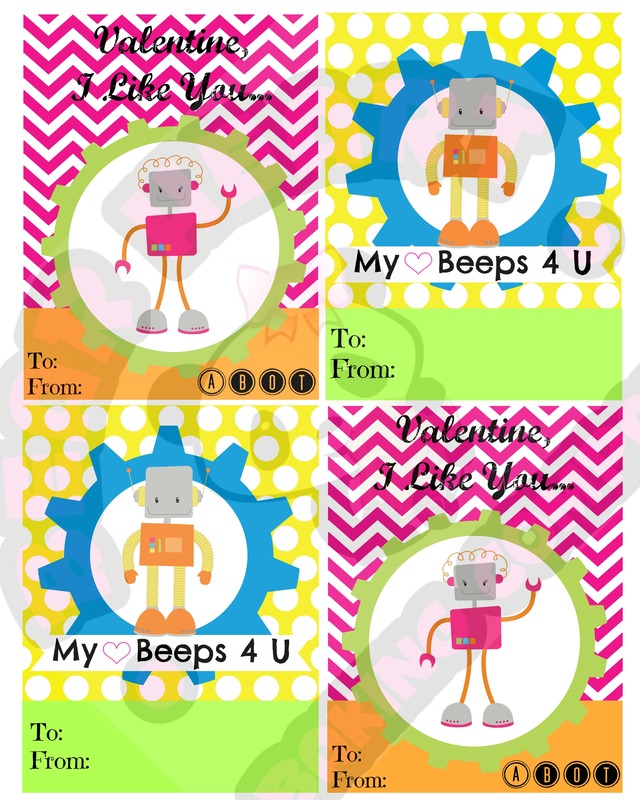 If you are searching early because you are a planner I am taking notes and you should know that there are Valentines Day cards to match this theme in my shop too. This game comes with instructions and all playing pieces just add conversational hearts and prizes. Add in some cute stuffed animal for the prizes maybe a box of chocolates and you are all set! Happy Valentines Day!! It is almost that time of year again! Classroom parties and fun decorative cookies will be filling the air. Goodie bags with conversation hearts with lollipops and valentine cards will be sent in to school to be handed out to classmates. Hard to believe Christmas was just 2 weeks ago and now Valentines Day is just around the corner.